Senior Women competing in Sunderland Harriers Ken Jefferson Memorial Cross Country Relay Races at Farringdon. 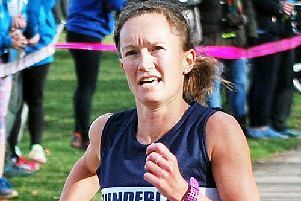 Sunderland Harriers women came out on top in the Ken Jefferson Memorial Farringdon Cross Country Relays on Saturday. In red hot temperatures, more in keeping for a day on the beach than the winter sport of cross country running, the Wearsiders turned on the heat to dominate the two events. The senior women and veteran women both enjoyed their first ever relay victories and it was fitting that it should happen at their own event. The Sunderland senior team came from behind in the three-stage relay over legs of 1.8 miles to win in 34.25 – just nine seconds ahead of Morpeth Harriers with Gosforth third on 34.48. After solid runs from Alice Smith (11.19) and Eve Quinn (11.47), anchor woman Jenna Wilkinson set off in third with much to do in chasing first place. Just back from Dubai where she has been teaching, she rapidly closed down Gosforth and passed Morpeth within sight of the finish. Her time (11.19) equalled that of Smith to surprise many. Sunderland also filled fourth place with Michelle Avery (11.50), Lauren Flaxen (12.54) and Haley Dobinson (12.56). Gosforth’s Rhian Purves recorded the fastest time of the day (10.40). The veteran women led all the way to win their relay after Vikki Cotton clocked the fastest overall time (11.51) on the opening leg. Colleen Compson then stopped the clock on 13.08 before Bev Martin (12.23) brought them home first in 37.22 to beat South Shields (37.47). Houghton finished third with Katherine James (12.58), Gillian Tomlinson (13.24) and Marguerite Harvey (12.42). The senior men’s relay was won by Morpeth (36.11) with Sunderland in second place (37.57) and Durham City third (39.37). The Sunderland team was Mark Smith (9.34), Sean Mackie (9.50), Kevin Jeffress (9.22) and Steve McMahon (9.11), the seventh fastest overall. Houghton Harriers were sixth (40.21) with Lee Dover (9.17), Adam Middleton (10.42) Steve Johnson (10.34) and Cameron Allan (9.48). Morpeth’s Sam Hancox was the quickest athlete on show with 8.44. The Sunderland Over-40 veterans won their event (38.18) by a street from Morpeth (41.08). The team was led by Ian Dixon who was the fastest of all runners with his 9.12 on the opening leg, Rob Walker recorded 9.35, Michael Thompson 9.54 and Paul Blakey 9.37. Walker, Blakey and Thompson recorded the second, third and fifth best times of the day respectively. The B team continued the Sunderland show by finishing third team (41.29) with Tim Field (10.11), Paul Merrison (10.35), Steve Gordon (10.26) and Brian Bewick (10.17). In the younger age group races, Houghton Harriers dominated the Under-17 women’s race by having the first three runners’ home in Lydia James (10.58), Eva Hardie (11.00) and Anna Pigford (11.06), in times that would have been among the fastest in the senior women’s relay. Blyth’s Josh Fiddaman sparkled in theUnder-17 men’s race, winning in 8.54 from Morpeth’s Ross Charlton (8.59) with Houghton’s England Athletics Under-17 1500m champion, Will Bellamy, third (9.02) and Samuel Gibson fourth (9.23). Shenali Scott made her Sunderland Harriers debut in the under-15 Girls’ race and filled second place (11.04) behind tiny Birtley runner Kate Francis (10.56). Sunderland’s Dylan Revell was fourth in the Boys’ race (9.59) and Houghton’s Tom Pigford finished fourth in the Under-11 Boys 1000m.